Prague was the first city north of the Alps where Hebrew books were printed, starting with a daily prayer book in 1512. Nine other editions preceded the famous illustrated Prague Haggadah, completed on 30 December 1526. 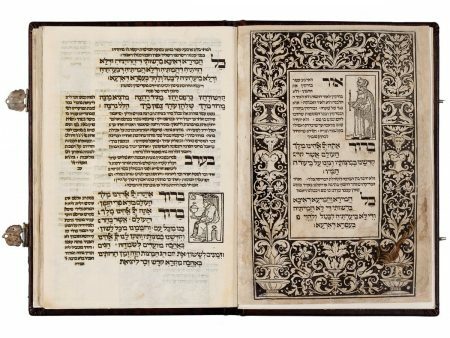 Printed by Gershom Katz and his brother Grunim, its woodcuts may have been the creation of Hayyim Schwarz. Today only a few complete copies of the Prague Haggadah remain. of the period. The illustration of a Jew searching for leaven in his home on the night preceding Passover shows a figure in contemporary dress with a candle in his right hand and a feather and a bowl in his left to collect the leaven. Similar images are found in medieval Ashkenazic manuscripts and in hundreds of later printed and handwritten illustrated Haggadot. The text on what is perhaps the most interesting page in the Haggadah, folio 25r, reads: “Pour out your fury on the nations that do not know you, upon the kingdoms that do not invoke your name” (Psalms 79:6). The verse has the messianic connotation that one day the enemies of the Jews will be judged. In fifteenth-century Ashkenaz the custom developed of opening the door during the reading of this text at the seder, to welcome symbolically the prophet Elijah, harbinger of the coming of the Messiah. Hill 1989, no. 26; Kestenbaum 2009, lot 124; Vinograd 1993, Prague 11; Yaari 1961, no. 6; Yerushalmi 1971, plates 9–13; Yudlov 1997, no. 7.